Reader comment: Will sanctions actually do anything? If Russia is willing to continue funding the government, what will sanctions accomplish? Haven't sanctions been placed on Belarus with very little effect? The foreign ministers of France, Germany and Poland will travel to Kiev on Thursday to assess the situation before a meeting in Brussels to decide whether to impose EU sanctions on Ukraine, French Foreign Minister Laurent Fabius said on Wednesday. 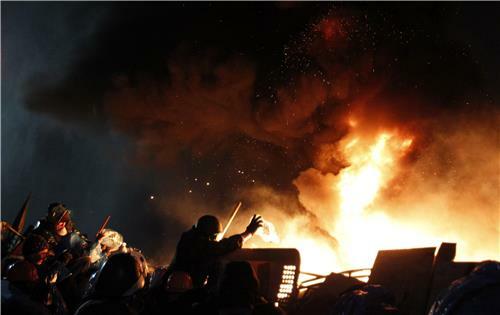 Earlier, Ukrainian President Viktor Yanukovich accused pro-European opposition leaders of trying to seize power by force after at least 26 people died in the worst violence since the former Soviet republic gained independence.
.@carlbildt says Rus rhetoric "chilling", @MID_RF tweets @ him: "Western countries trying to project everything frm their ill minds onto us"
Reader comment: Should the country be split in two and get a infusion of money? 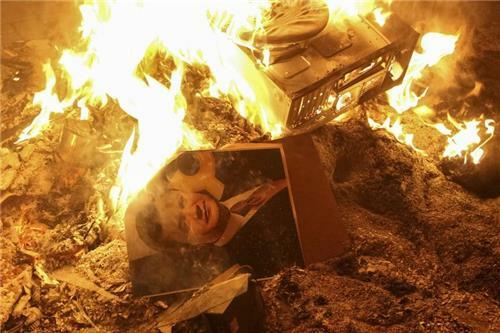 @David_Cameron - "Yanukovich should be under no doubt that the world is watching his actions. 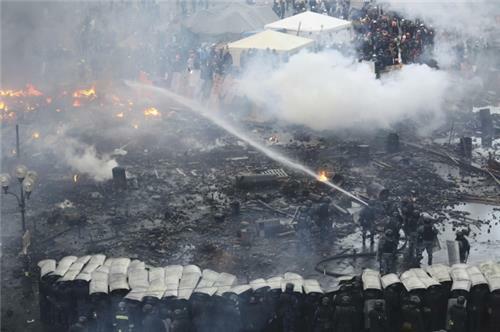 Those responsible... will be held accountable"
Photo below shows extent of security forces' advance on the protest site in central Kiev. Area shown was previously occupied by tents, soup kitchens and volunteer points providing warm clothing and medical care to protesters. LONDON (Reuters) - Ukraine's sovereign dollar bonds hit record lows across the curve on Wednesday as concerns intensified over the country's ability to repay its debt. Moscow deflected questions about when Russia would release the second instalment of a $15-billion bailout package for Ukraine . The central bank is fast running out of reserves, raising concerns that without an external bailout Ukraine may head for a default. GENEVA (Reuters) - All sides involved in Ukraine's violence must exercise maximum restraint, U.N. human rights chief Navi Pillay said on Wednesday. "I reiterate my call for respect for the right to peaceful assembly, as provided under international human rights law, to be respected," Pillay said in a statement. "I also call for an urgent and independent investigation to establish facts and responsibilities, including the possible use of excessive force, and to ensure accountability for these deadly clashes," she added. WARSAW (Reuters) - Dozens of Ukrainians blocked a road to a border crossing into Poland on Wednesday, the Polish boarder guard service said, adding that no other crossings had been affected so far. "We have received information from people who still managed to cross the border that about 200 Ukrainians were blocking this morning the road to the Korczowa crossing. There could be about 300 now," a border guard press officer told Reuters. 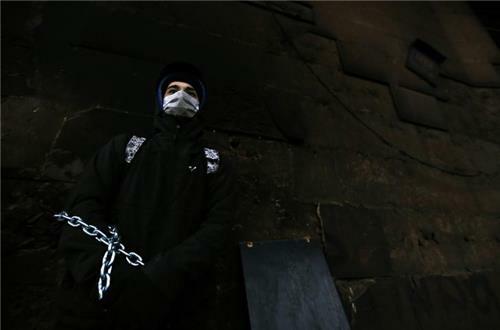 "We cannot be sure but some information suggests that they are oppositions protesters," the press officer added. The blockage was reported inside Ukrainian territory, near the crossing over the border to the Polish village of Korczowa. MOSCOW (Reuters) - Russia on Wednesday demanded that Ukrainian opposition leaders "stop the bloodshed" in Kiev and said Moscow would use all its influence to bring peace to its "friendly brother state". "The Russian side demands that leaders of the (opposition) stop the bloodshed in their country, immediately resume dialogue with the lawful authorities without threats or ultimatums," the Foreign Ministry said in a statement. "Ukraine is a friendly brother state an a strategic partner, and we will use all our influence in order for peace and calm to reign," it said, without giving any detail about what steps Russia might take. 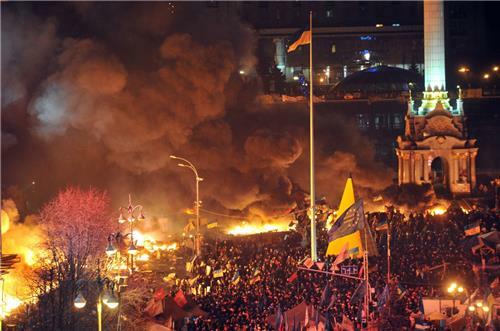 Current events in #Ukraine were painfully predictable, yet #EU express shock. Targeted sanctions earlier could have prevented escalation. Excellent that Catherine Ashton has now called the FM's of EU to an extraordinary meeting in Brussels tomorrow at 14:00. 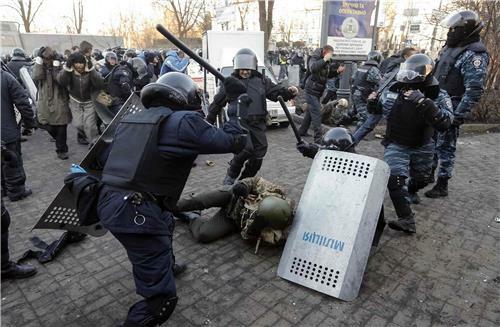 BRUSSELS (Reuters) - European Union governments are expected to urgently agree sanctions against those responsible for violence and use of excessive force in Ukraine, European Commission President Jose Manuel Barroso said on Wednesday. "We have ... made it clear that the EU will respond to any deterioration on the ground. We therefore expect that targeted measures against those responsible for violence and use of excessive force can be agreed by our member states as a matter of urgency," Barroso said in a statement. "We call on all sides to immediately put an end to the violence and engage into a meaningful dialogue, responding to the democratic aspirations of the Ukrainian people," he said. I was saving money for months and now spend it all in shop buying food for #euromaidan .can't think of a better way to use them. Our athletes are competing hard in Sochi, but peacefully and with honor. Violence has no place in the World. Ukrainian Olympic Committee chief and former pole vault champion Sergey Bubka - "I want to bring Olympic Truce to my country. Dialogue is power, violence is weakness." 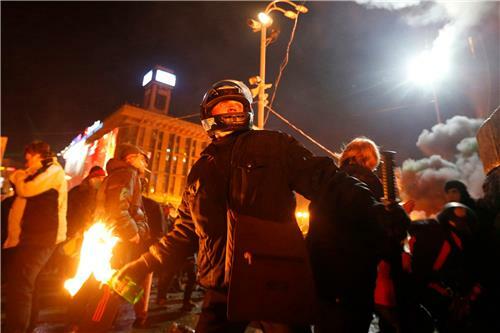 Acting Ukrainian Prime Minister Serhiy Arbuzov said on Wednesday that overnight clashes between police and anti-government protesters in Kiev amounted to an attempted coup. "This was not a demonstration of democracy ... It is the manipulation of people's minds and an attempt to seize power by force," he told a televised government meeting. 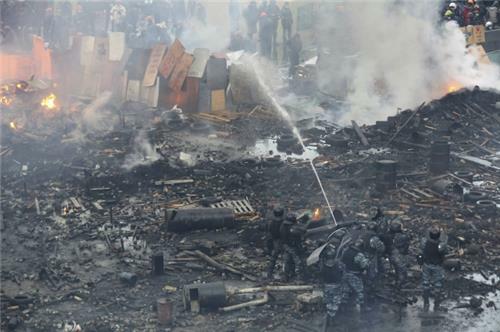 Picture below shows the destruction of Kiev's protest encampment overnight. Area shown was previously site of soup kitchens and tents housing the hundreds of anti-government protesters who have occupied Independence Square since November last year. 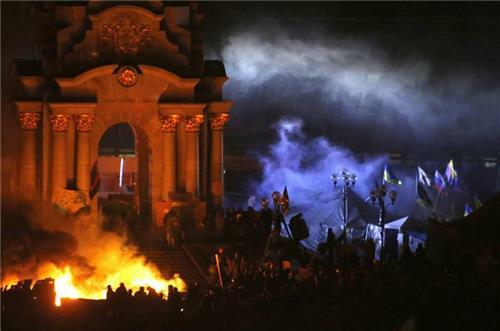 KIEV (Reuters) - Ukraine's interim prime minister said on Wednesday that protests which brought violent clashes with police on Tuesday amounted to an attempted coup. "This was not a demonstration of democracy ... It is the manipulation of people's minds and an attempt to seize power by force," Serhiy Arbuzov told a televised government meeting. 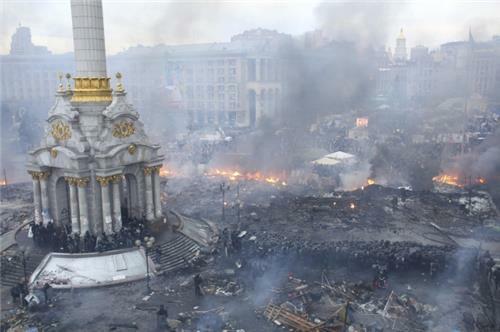 KIEV - Ukrainian protesters poured on to a central Kiev square on Wednesday, preparing to confront police anew after the bloodiest day since the former Soviet republic, caught in a geopolitical struggle between Russia and the West, won its independence. 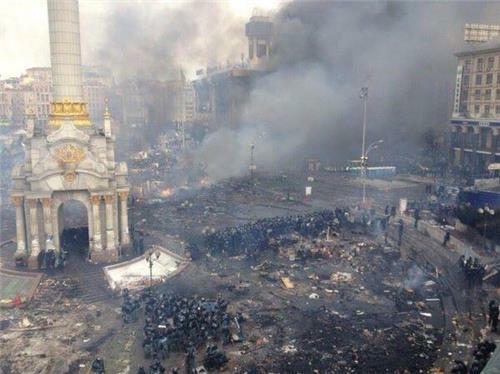 After hours of clashes, police had gained ground overnight in Independence Square, center of three months of protests against President Viktor Yanukovich, and were occupying about a third of the square at 8 a.m. (0600 GMT) on Wednesday. The square resembled a battle-zone with black smoke and flames belching from a trade union building, used as an anti-government headquarters. The Health Ministry, updating the casualty toll, said 25 people had been killed in the fighting in the capital, of which nine were police officers. 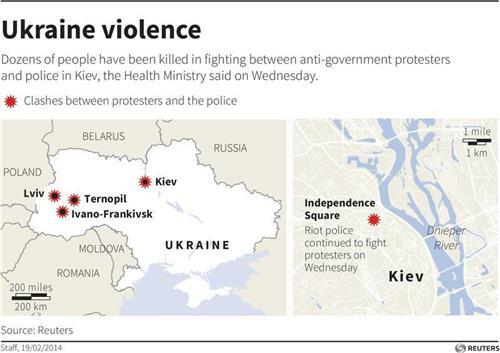 The Daily BeastYour cheat sheet to the complex web of money, power, and politics behind Ukraine’s violent protests. 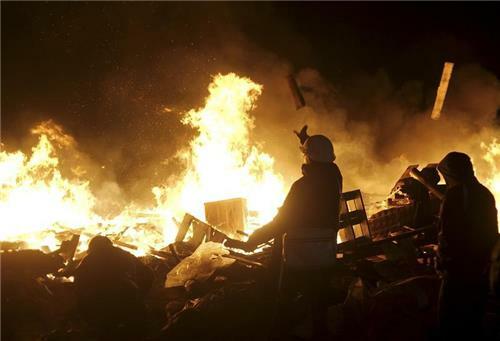 NewsThe call comes after at least 18 people were killed in the latest clashes between protesters and riot police in the capital Kiev in the bloodiest outburst of violence in Ukraine over the past three months. 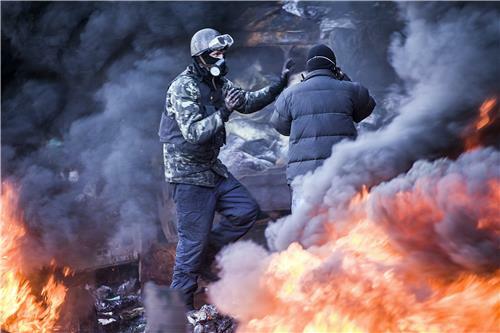 Kiev has been wracked by anti-government protests since President Victor Yanukovch rejected a European Union pact last November in favour of closer ties with Russia.